We are very excited to share with you our reviews regarding our wedding video equipment. This week, we are reviewing the Canon 24-105 mm 1.4, and we like about it, and it’s limitations. In wedding videography and in live events, being prepared is extremely important because as we have discussed before, you only get one chance. So when deciding to add a lens to use with our Canon 5D Mark II, we opted for the Canon 24-105 mm. And I can say with confidence that this is the most versatile lens we carry. 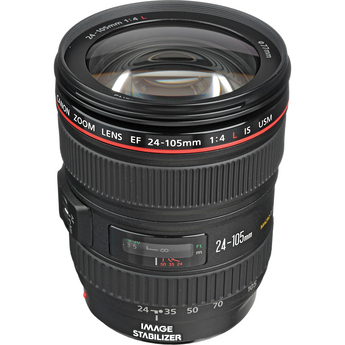 The Canon 24-105 mm is both a wide and a telephoto lens, it’s great for ceremonies and receptions. You can basically cover a wide angle with an establishing shot, and go to close up of bride and groom without switching lenses. This lens perform better during daytime, and in pretty good lit situations, but with an aperture of 4 you need extra lighting during night time and during low light situations. Manual focusing is fairly easy, but not as smooth as with a 27-70mm, but with enough practice you can achieve very accurate focusing.